Is anyone interested in a 2010 Abstract Rug Challenge? I have been thinking about hooking an abstract, something that isn't concentrated on pictorial form, but texture or color or value - something free form and less planned than I am usually comfortable with. I haven't seen too many abstracts hooked, and then only in photos or magazines. I'm not studied in terms of abstract art either. So I'm a bit apprehensive. But 2010 seems to be as good a year as any to try something new and push the boundaries of what I normally choose to hook. 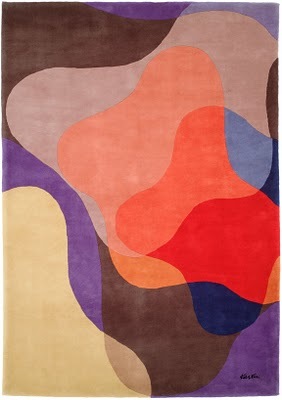 I'm wondering if anyone else would be interested in a 2010 Abstract Rug Challenge? We might find and read together a modern art book once a month as we each work on hooking our own abstract piece. This might help inspire us and we can learn about modern art along the way. I'm thinking something doable but challenging: at least 400 square inches (for instance: 20 by 20 square; or 15 by 27/17 by 24/10 by 40 rectangle; or an irregular or round)? Materials: anything goes? Finish deadline: December 31? What ideas do you have? Are you interested?